Candace1009, last chance to collect your free planner! The winner of the Personal Planner giveaway, candace1009, has not contacted me to collect her prize. Candace1009, please email me! Plannerisms (at) gmail (dot) com. If I don't hear from you before April 2, I'll have to randomly generate a new winner. That will be two weeks since I announced the winner. This prize is too good to waste! If the original winner is unable to collect it, it will go to a new winner. So Candace1009, if you're out there, please email me right away! Please vote in the poll over there in the sidebar! There are lots of reasons why people use a paper planner. Personally I like the visual and tactile aspect of the book. I remember things better when I write them down. And I like to use my planners as a permanent record of events. I've read about lawyers who are forbidden from using electronic devices in the courtroom and students who aren't allowed to use devices in the classroom, so these folks use paper planners. Why do you use a paper planner? Please vote! Today you can get 50% off your customized Moleskine folio from Rickshaw Bags! Play around with their Customizer and check out their new spring colors (click here!)! Online orders only. For 24 Hours only. 4am PST 03/28/12 to 4am PST 03/29/12. 50% off ANY Folio – any style, color and fabric, half-price. We're fanatics about writing in our Moleskine Journals. Our Folio offers you the perfect pairing of your digital and analog life. It's all you need for your daily excursions about the city, an adventurous jaunt overseas, or your next work meeting. Assembled-to-order in the USA, in our own San Francisco factory. Act fast, and tell your friends! Offer expires tomorrow (03/29/12) Exclusively and only offered on the Folio. *May not be combined with any other offers, special orders, or embellishments. This time last year I found out the hard way that April-May-June is the Planner Dry Season. The current-year planners are just about sold out. The academic and mid-year planners don't start for several months yet. If you're experiencing Planner Fail or are in need of a new planner due to changes in circumstances (higher workload, for example) you might have a hard time finding a new planner. Luckily there are several planner options that begin now! Planner Pad (click here to read my review) has the option to choose which quarter you want your planner to start, and goes for 12 full months so your year can start in whichever quarter you choose. If you use a binder organizer (like Filofax or Franklin Covey) there are some April-start options for you. Click here to see Franklin Covey's April-start inserts. Personal Planner UK lets you choose which month your planner starts, and goes for a full 12 months, so your planner can start in any month at all. 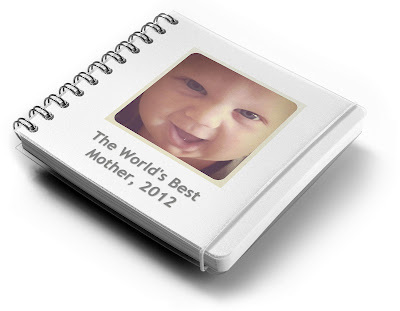 You can also choose just about every feature of your planner from the layout, cover, features and end pages. Click here to see my post about it. 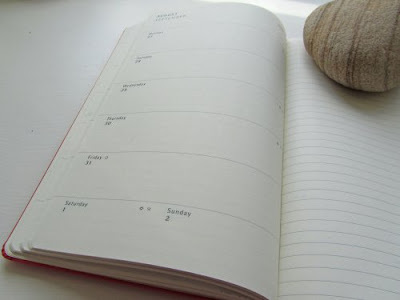 An option that allows you to start your planner on any day of the year is an undated planner. My very favorite undated planners are by Uncalendar (www.uncalendar.com), which has several options including bound Full Size (see my review here), bound Half size (see my review here), and 3 ring binder versions of the Full Size and Half Size. Uncalendar planners also have designated goal-setting pages and loads of tips for setting and achieving your goals. I actually just ordered a bunch of these last week: new Full size and Half size bound, and a stack of their Monthly planners. So no matter what nuttiness this spring brings, I'm prepared! If you'd like to print your own, check out Steve and Ray's excellent selection of formats they created and posted over on Philofaxy (click here for the printables list with links to the files). These are designed to be hole-punched and used in a Filofax or similar binder, but you could also have them bound into a book if you prefer. What about you? Are you entering the Planner Dry Season satisfied with your current system? Or are you searching for a new planner now? There's an excellent new blog out of Ireland about planners and diaries! So nice to see someone else who is addicted to loves diaries and planners too! Many thanks to everyone who participated in the Personal Planner UK giveaway! Congratulations!!! Email me at plannerisms (at) gmail (dot) com so I can pass your email address on to Personal Planner UK. They will email you your code which will allow you to create your personalized planner for free!! Poll result: How important is acid-free paper in your planner or notebook? To be honest I was expecting more people to say that acid-free/ archival paper is important to them. After all, the paper planner and notebook crowd is more likely to value long-term archiving than the electronic crowd, or so I assumed. But it turns out, it doesn't matter! A friend of mine in the planner business told me after I started this poll that acid-free paper is an industry standard these days, and 99% of paper is acid-free whether the company advertises it as such or not. Even the notebooks you buy at the grocery store most likely have acid-free paper. This is great news to me! I'm in the group of people who will only buy a planner or notebook if the paper is acid-free. Now that it's a non-issue, this opens up all kinds of great planner and notebook options for me! I can use whatever I like without worrying about my writing fading over time. Many thanks to everyone who participated in this poll! Many thanks to reader Myra for sending me the link to Personal Planner UK (www.personal-planner.co.uk)!!! I've seen planners where you can personalize the cover, but this is the first planner I think I've ever seen where you personalize the format, features, and extras. And there are TONS of options and extras to choose from!! 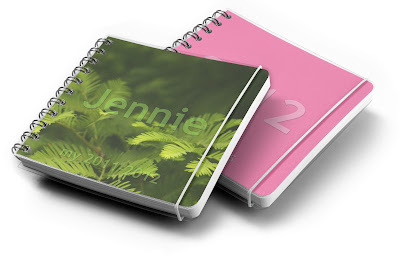 First of all, you can choose from 3 different sizes of planner. 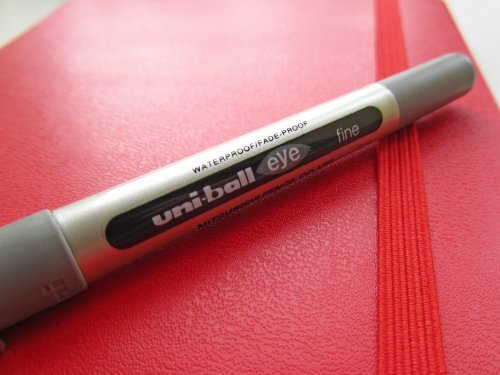 Then you choose the color of your cover, upload a photo, write your name or whatever else you want. If you choose text, you can choose how bold you want it to appear, and if you want it outlined. You can even choose the color of the elastic closure. AND you can choose which month you want your planner to start, and it goes for a full 12 months. Next you start with the basic weekly format and add whatever elements you want to the days and the notes spaces. You can add daily details like weather icons, a space to record work hours, and a large or small space to record your workouts. You can add in your own personal dates. You can choose if you want the day spaces timed or not, lined or blank. You can even choose which color you want the plastic pagemarker to be! In the writing space below the days you can choose from loads of options like Lists, To Do, Notes, Ruled, Graph, and teacher or homeschool specific elements for Preschool, Exams, Pupils, Idea of the Week, and more! I've never seen anything like it!! THEN you even get to choose your back pages. You can get year overview planners, ruled, squared, sheets of music, address and phone number pages, coloring book pages if your kids (or yourself, for that matter) get bored while you're out and about, Sudoku pages, and more! This planner looks really amazing and I love how you can personalize every aspect of it to fit your needs and desires! Has anyone ordered one of these planners before? Tell us about it! 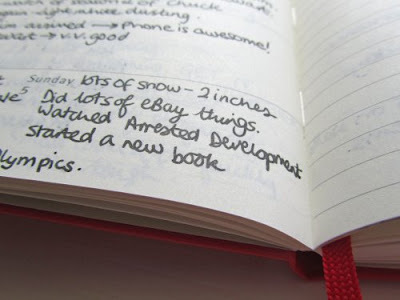 Guest post: Millie's Moleskine weekly notebook as journal! Huge thanks to Millie (aka MsLogica) from Planet Millie (which you must go read and see her beautiful photographs) for this excellent guest post on how she uses her Moleskine weekly notebook as a journal! What a brilliant idea! I remember when I announced that I had bought a new planner on Twitter, and I got tweets to ask if that meant I was abandoning my Filofax. I use a Malden in the personal size for my everyday planning needs, and people thought I might be leaving the Filofax club. Certainly not! I bought a Moleskine planner to use as a daily journal, and Laurie has kindly let me come on Plannerisms to discuss this. I bought the large weekly planner in red from Moleskine, which has a similar format to the week on one page with notes from Filofax. My only gripe with this layout is that Saturday and Sunday have only got half the space of the other weekdays. I want equal rights for Saturdays and Sundays! I have just as much stuff to write in their sections. This is especially true given my reason for buying the Moleskine. I keep a regular journal, which is a blank notebook where I can ramble on about whatever takes my fancy. However, I decided to supplement this with a daily journal that specifically recorded what I'd been up to, anything amusing I'd seen that week and other such things that make up daily life. I jot down a few sentences on my day, and occasionally write down quotes. The blank notes page is used for larger prose I want to write - for example at the end of the month I do a quick analysis with some facts and figures for the month. I go into this in more detail in my normal journal, but this planner gives a quick snapshot of my life. I keep my planner next to my bed, in my bedside table. It has a pen attached so that there is no excuse for me not writing in it every evening. It usually takes less than 5 minutes to jot down a couple of sentences. If you'd like to keep a journal, but struggle whenever you start, I'd recommend keeping a daily journal in a planner format instead. The layout forces you to write something for each day, and the extra space in the Moleskine weekly planner means you can write more if you get the urge to do so. It's an easy way to get into a journalling habit, and it will give you something to look back on in the future. New poll: How important is acid-free paper in your planner or notebook? Please vote in my new poll over there in my sidebar: how important is it to you that the paper in your planner and/ or notebook is acid-free? Acid-free paper is less likely to break down over time and fade your inks, so it is an indicator of archival quality paper. Many brands specifically say they use acid-free paper (click here see my post on which brands I know of that use acid-free paper). Personally, I specifically look for planners and notebooks that use acid-free paper. I keep my planners and notebooks forever, and I want to be able to read them decades from now. In fact, acid-free paper is so important to me that I'll buy a product I otherwise don't prefer (for example, Moleskine with its too-dark paper and boring black covers) because I know the paper is acid-free. What about you? Will you only buy a product if you know the paper is acid-free? Is it an added bonus for you if the paper is acid-free, but if it's not you'd buy the product anyway? Or is acid-free paper not at all important in your purchasing decision? Please vote! Yes I know it's only barely March, but I'm already getting excited about next year's planners! There are some exciting new covers and colors coming for 2013! And, a new weekly planner called the Hebdo which will also have monthly calendars too. Hooray! PS I saw on the Quo Vadis blog that Quo Vadis academic-year planners will ship to retailers April 1, and will be shipping to customers soon after. It's never too early to plan your planning!